This small home may look plain, but it represents a significant achievement in rapid construction. A Chinese company has demonstrated the capabilities of its giant 3D printer by rapidly constructing 10 houses in less than 24 hours. Built from predominantly recycled materials, these homes cost less than US$5,000 and could be rolled out en masse to ease housing crises in developing countries. If you’ve been to a major city in China recently, you’ll have noticed a theme. Construction is absolutely rampant, with skyscraper after skyscraper going up as cities scramble to deal with a massive population that’s urbanizing at an unprecedented rate. 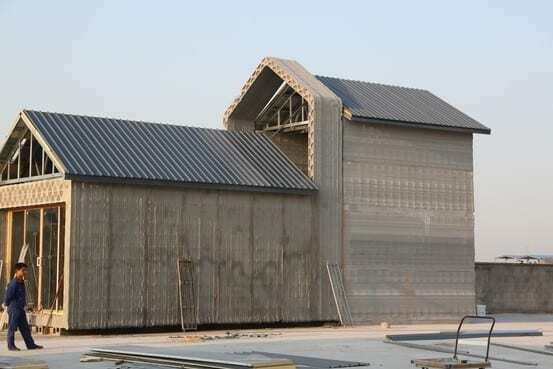 Outside the major urban centers, there’s still a vast need for quick, cheap housing, and Suzhou-based construction materials firm Winsun has stepped forward with a very impressive demonstration of rapid construction by using 3D printing techniques to build 10 small houses in 24 hours using predominantly recycled materials. Rather than printing the homes in one go, Winsun’s 3D printer creates building blocks by layering up a cement/glass mix in structural patterns (watch the process here). The diagonally reinforced print pattern leaves plenty of air gaps to act as insulation. These blocks are printed in a central factory and rapidly assembled on site. April 8, 2019 - COBOD Begins Distributing BOD2 Construction 3D Printing ENGINEERING.comEngineering.com speaks to the Danish construction 3D printing company about its second-generation concrete 3D printer and more. March 26, 2019 - 3D Hubs raises $18 million to ship 3D-printed products to your door VentureBeat3D Hubs, which provides manufacturing services to a range of customers, has raised $18 million to expand services abroad.